A three member team from the All-India Council of Technical Education (AICTE) visited the Chandigarh College of Art, Sector 10, today following a proposal sent by the college to the council to approve its postgraduate course in fine arts. The visit of the team was vital since the college has been waiting for the AICTE approval for the past two years, ever since the council had sent a letter of intent to the college. The two-year course, Masters in Fine Arts (MFA) had been put on the hold, allegedly due to bickering between college staffers. Sources say disgruntled teachers, opposed to appointment of new MFA lecturers by the college authorities, had succeeded in delaying the course. The college Principal, Mr Brahm Prakash, said the team seemed to be satisfied with the college infrastructure and the facilities being provided to the students. He added that another team from the AICTE had visited the college two years ago and whatever deficiencies had been pointed out by the team then had been taken care of by the college this time. If given an approval by the AICTE, the Chandigarh College of Art would be the second institute in the country to offer an AICTE-approved masters in fine arts, the other being at Jamia Millia Islamia University at New Delhi. Mr Brahm Prakash added that the college had been through a series of inspections by a committee constituted to look into the matter of granting provisional affiliation to the MFA course by Panjab University. The inspection committee has already met thrice between August 18 and October 27 . And following a final nod from the PU Vice-Chancellor, the admission process to the new course had been started. The AICTE would be communicating the results of its team visit to the college shortly. Students of St. Anne’s Convent School, Sector 32, perform a dance at the annual function “Rhapsody-2204” on the school premises on Tuesday. — A Tribune photograph. It was a special day for the students of Government Model Senior Secondary School, Sector 46, today. Dressed in colourful attires, the students presented cultural items at the annual prize distribution function held in two sessions. In the morning session, Ms Rajesh Chaudhary, District Education Officer, gave away prizes to students who had topped in their respective classes. The DPI (Schools), Mr D.S. Mangat, gave away the prizes in the second session to the students who had achieved the top positions in classes VIII, X and XII. A special honour was given to the school Principal, Mr R.S. Goraya, for the Sanchayaka, a small saving scheme. As many as 800 students, teachers and PTA members were honoured on the occasion. The function began with a shabad kirtan. Then the students gave a scintillating performance of a remix dance. Mr Jatinder Bhatia, a Municipal Councillor, was also present on the occasion. 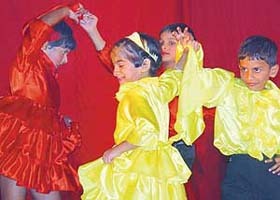 St Anne’s Convent School, Sector 32, organised its annual function “Rhapsody-2004” on the school premises on Tuesday. The Regional Officer of the CBSE, Mr P.I. Sabu, presided over the function. The show began with an impressive pooja dance invocation. The highlight of the show were fantasy land story “ Snow White”, “ The Green Crusaders”, based on the concept of saving environment with a message ‘pollution a demon-do not waste water, plant more trees”. A Biblical play ‘‘The Prodigal Son” spoke volumes on the virtue of forgiveness. A Goan dance, qawwali and an item ‘Rangla Punjab’ depicting four seasons were staged. The show was compered by students Raghav and Sakshi. Teachers at Vivek High School, Sector 38, are getting a unique training on critical thinking, and devising lessons and portfolios from Dr Linda Farr Darling, an Associate Professor at the University of British Columbia. She will remain at the school till December. Talking to mediapersons at the school, Dr Darling said she would be helping teachers to design their portfolios and lessons. She said that the portfolio of critical thinking required the teachers to be avid learners. Dr Darling, who specialises in training pre-service teachers for primary and pre-primary education, said she worked on cooperative learning, shared projects, models for critical education and using less of textbooks. Her main research interests are in the area of young children’s moral understandings, and in the development of empathy in primary students, interests that grew out of study in educational philosophy. The Arya Bhatta Educational Society has declared the result of AET-2004 (Preliminary). The test was conducted on October 31 at Chandigarh, Ludhiana, Jalandhar, Amritsar, Bathinda, Karnal, Patiala, Rohtak, Hisar, Fatehhabad, Ambala and Faridabad. Thousands of students of classes 5 to 12 appeared in the examination. The main objective of the society was to let students know their standing at the regional level. As part of the ongoing 76th martyrdom fortnight of Sher-e-Punjab Lala Lajpat Rai, the Servants of the People Society organised inter-school skit competitions. The topic of the competitions were drug abuse, HIV/AIDS, reproductive and child health. Around 94 children from nine schools participated in the competitions. Prof V.R. Mehndiratta inaugurated the function and Dr N.N. Wig was the chief guest. He also gave the prizes to the winning teams. The first prize was bagged by C.L. Aggarwal DAV School, Sector 7, Chandigarh, and the second prize went to Government High School, Sector 24, Chandigarh. Bhavan Vidyalya, Sector 27, took the third prize. Our school was established in 1990 under the guidelines of the Sherwood Convent Education Society. Our qualified staff stresses on personality development, indoor/outdoor games, and value-based education. Day boarding arrangement have been made for students after school hours. Students are allowed to wear the dress of their choice on birthdays. Every Wednesday students take part in activities like march past, inter-classes and inter- houses competitions, matches and folk dances. The school is affiliated to the All-India Teachers Vocational Training and NCERT, New Delhi. The school organised poetry recitation and dance competitions, art and craft exhibitions, project work on social and scientific topics and sports day. Students of pre-nursery and K.G. prepared candles and those of Classes I and II prepared owls out of newspapers and coloured paper baskets were made out of the soap. Coconut shells were decorated by them. The school celebrated Teej festival, rakhshabandhan, Independence Day, Janamashtmi,Durga puja, Divali, Children's Day, Christmas Day, and Republic Day on its premises. Education is a medium through which a person gains vision, knowledge, dignity, drive and the power to reform. Children are the assets of our country, the foundation of our society. A child must be accepted, liked, trusted, encouraged, supported and motivated to enhance his\her confidence and sensibility. It is also essential to give a free hand to children. Teachers should tap children's talent and nurture it with their valuable guidance and support. We plan our activities to help students to be independent, self reliant and responsible in the society. Students of the local Government College had an interesting interaction with Brigadiar Kuldeep Singh Chandpuri (red), a Mahavir Chakra winner and the hero of the Battle of Longewala of 1971. While giving details of the battle at the Longewala post in Rajasthan, Brigadier Chandpuri told the students that the battle could not be won just because he fought bravely at the front but due the bravery shown by jawans of the Sikh Regiment during the war. They fought fearlessly and that was how a company comprising nearly 90 jawans, headed by him, defeated a Pakistan division, comprising 3,500 jawans and fully armed. He said the Sikh Regiment had lost 16 jawans in the war at the Longowala post and another 16 got injured. He also got an injury while fighting the enemy. The casualties on the Pakistan side were much higher and number of officials were sacked by the Pakistan Government for giving a poor performance on the Rajasthan border. While addressing students, most of whom came from rural areas, the Longewala hero said he, too, was from a rural background. He said 90 per cent of those serving in the defence forces had a rural background and they were always considered better fighters than those coming from urban areas. Mr J.P. Dutta had made a film, Border, picturising the Longewala Battle. When he was greeted by the college Principal, Ms Mandeep Kaur, today a song from the film was played. when a student asked Brigadier Chandpuri whether he used abusive language against the enemy during the war, as had been done by Sunny Deol who portrayed his character in the film, he said he had abused the Pakistan Army much more than had been shown in the film. Battles cannot be fought without using abusive language, he told the students in a lighter vein. Prof S.K. Kanwar presented a life sketch of Brigadier Chandpuri before the Longewala hero addressed the students. Various programmes were organised at a Government College here as part of the National Integration Day celebrations. A number of competitions were organised by the college literary society, economics and Music Society and science maths society. The function was presided over by the college Principal, Mr O.P. Sihag. Poems on national integration were recited and a quiz contest was organised on the occasion of cashier of Cultural items were also presented by the students. Students took a pledge not to take any dowry and to work for communal harmony. Results of the various competitions are as follows: Quiz: Puja, Bindu and Shivani — first; Arushi, Jyoti and Meena — Second; Seema, Vikram and Naveen — Third. Sri Guru Gobind Singh College, Sector 26, hosted a national seminar on ‘Bhai Kahan Singh Nabha’ on the college premises here today. The seminar was organised by the Sikh Educational Society. Mr Surjit Singh Barnala, Governor, Tamil Nadu, who was the chief guest, was given an impressive guard of honour by NSS students of the college. Mr S.S. Boparai Vice-Chancellor of Punjabi University, presided over the seminar. Mr Jai Singh Gill, Chief Secretary, Punjab, was the guest of honour. Dr Jagmail Singh, Dr Harnam Singh Shaan, Prof Dharshan Singh and Dr Tejwant Singh Gill presented papers on Bhai Kahan Singh Nabha. Bhai Kahan Singh Nabha was an intellectual of the 19 th century whose writings and action left a deep impact on the region. He wrote the first definitive encyclopedia in Punjabi Gurshabad Ratnakar Mahankosh’. The Sikh Educational Society president, Mr Gurdev Singh, and secretary Bharpur Singh also spoke on the occasion. Major Adarshpal Singh (retd), great grandson of Bhai Kahan Singh Nabha, and Mr Sukh Dev Singh Dhillon were also present on the occasion. A City Court, hearing the journalist Shivani Bhatnagar murder case, today released prime accused suspended IPS officer R.K. Sharma on parole for two days to attend a marriage in Chandigarh. Additional Sessions Judge Sunil Gaur ordered the release of Mr Sharma on parole between 9 am on November 27 and 5 pm on November 28 to attend the marriage of a woman, Shiva, who stays with his family at Panchkula. In an application, Mr Sharma said Shiva was like his daughter and he might be released to attend her marriage. Shiva, working with the Haryana Police as a constable, had been staying with the Sharmas ever since her mother left her. The Tihar Jail authorities and the Panchkula police were directed to arrange for the transit. A public-interest petition, seeking investigation by the Central Bureau of Investigation (CBI) into the alleged financial irregularities and misappropriation of over Rs 6 crore by the management of Chandigarh Club, has been filed in the Punjab and Haryana High Court. The petition also prays that till the pendency of the writ, the charge and control of the club be handed over to a retired Judge of either the Supreme Court or the High Court. The petitioner, Mr Vikas Kumar, who is a permanent member of the club, alleged that the present office-bearers of the club had been embezzling money meant for the club through various means. He alleged that most of the embezzlement and irregularities took place during the enrolment of new members. Saying that no system was being followed for the sale of liquor at the club bar and the irregularity had also been highlighted in an audit report, the writ alleged that liquor being sold was not being purchased by the club, but was being supplied by one of the executive members who was looking after the affairs of the bar. He has alleged that another executive member, who was the owner of a company manufacturing ice cubes, had been supplying ice cubes to the club. Among the respondents in the writ are the UT Administrator, the CBI, the Chandigarh Senior Superintendent of Police, the club general manager, acting president Sunil Khanna and executive member Sandeep Sahni. The writ is likely to be heard on November 29. A local court today remanded two employees of the District Courts, who were trapped by the CBI yesterday, to judicial custody. Assistant Avtar Singh and clerk Harnek Singh were arrested when they allegedly demanded a bribe of Rs 1,000 from a complainant for allowing him to see a case file. The complainant had reportedly got permission from the Section Officer to see the file. A friend dropped in after a rainy evening. The rain had stopped and the sun was playing peek-a-boo with clouds. But the crowning glory was a big rainbow stretching across the azure sky. ‘’Let us go, for a walk’’, said my friend. ‘’Where?’’ I asked. ‘’Till the end of the rainbow.’’ ‘’Why?’’ I asked in disbelief. ‘’Don’t you know? At the end of rainbow lies a pot of gold,’’ he claimed. This rainbow is an important part of our daily diet too as all kinds of hues can be seen on our platter. Though the pot of gold still remains elusive, but this rainbow on our platter can provide us with even a better wealth than gold - our health. Eating not just greens but also red, pink, blue, purple, yellow, orange and white vegetables and fruits can provide many benefits as these vegetables are naturally rich in essential vitamins, minerals, fibre, phytonutrients, are cholesterol-free, low-fat, and low-calorie. But apart from these benefits, colourful vegetables and fruits have another secret ingredient that packs a healthy punch to our diet. The pigments which provide colour to these vegetables and fruits are powerful antioxidants that prevent harmful free radicals from damaging our body cells, say Ms Damandeep Kaur, Head of the Department of Food and Nutrition, Government College of Home Science, Chandigarh. So let’s take a look at this VIBGYOR of health. Brinjal, plums, beet root, blueberries, black currants, purple grapes, jamun, blackberries, strawberries, etc. The colour-giving pigment is anthocyanin, which is a powerful antioxidant that prevents heart diseases and strokes and lessens the risk of cancer. Anthocynins also protect brain cells from wear and tear and preserve memory as we get older, says Dr Neelu Malhotra, a Mohali-based nutrition expert. Spinach, fenugreek leaves, coriander leaves, mustard leaves, green capsicum, green beans, peas, pears, guava, gourds (bitter, long, round) lady finger etc. The pigments are chlorophyll and lutein. These help in building the haemoglobin and purify blood. These foods are also rich in vitamin A & C, iron, folate and soluble fibre. Another green family or the cruciferous family (cabbage, cauliflower, broccoli, nolkhol) contain a chemical substance called sulphorophane which stimulates the body to produce its own anti-cancer enzymes. It also reduces inflammation and improves cardiovascular health. Citrus fruits contain a pigment called hesptritin and carotenoids. They detoxify cancer-promoting substances. beta carotenes get converted into vitamin A, which in turn promote healthy skin and eye health, prevent night blindness and boost immunity. They are also a rich source of vitamins A and C, potassium, soluble fibre etc. Tomatoes contain a pigment called lycopene which is a powerful antioxidant known to prevent prostate cancer. Also cherries, red grapes, red apple, red wine, watermelon, grapefruit etc. Red grapes and red wine also contain a chemical called quercetin, another powerful anti-oxidant, which prevents skin cancer and lowers blood cholesterol, says Dr Sudha Khurana, Consultant Dietician, Department of Dietetics, PGI. Corn, papaya, mango, pineapple, lemon yellow capsicum. The pigment is zeaxanthin. They also contain beta cryptoxanthin and flavonoids. These substances protect vision, help fight cataract, prevent retina from harmful radiation and prevent macular (eye) degeneration. Mushroom, garlic, onions, turnip, radish, banana. The pigment is anthoxanthin. They also contain allylic sulphafide, flavonoids etc. Onions are a good source of quercetin which lowers cholesterol while allylic sulphafide fights carcinogenes and prevents tumours, while flavonoids protect cells from damage by free radicals. The WHO has recommended five to nine servings of fruits and vegetables as part a daily healthy diet. To maximise the benefits of these servings get these essential colours on your plate for a complete nutritional profile. Captivating smile broadens just a little bit as Pakistan’s former skipper Wasim Akram grips a cheerful red cap with firm fingers before settling down in a Sector 17 showroom for a short innings with his fans. As he flirts with the cap before tossing it over his head to suit his style, you realise that the picture of glamour is complete and perfect. Glamour has nothing to do with it, but Akram is also in favour of women playing cricket. “If women can wrestle, they can also make the game a big hit,” he agrees. Rubbing his hand enthusiastically, Akram says he really does not know why women cricket has failed to make the popularity board tick. He refuses to duck when you throw a bouncer about hostility between the two countries. Standing tall, Akram agrees that delegates talk about brotherhood and peace. But fans in both the countries burn effigies and indulge in stone pelting after their team loses. Indian cricket players waste a lot of time on appeals — that is what Sultan of Reserve Swings Wasim Akram had to say about initial decision to impose penalty imposed on Indian skipper Saurav Ganguly for the teams failure to complete overs on time. The problem of completing overs within the stipulated period of time, he added, was not uncommon as far as India and Pakistan were concerned. Referring to the present lot of Pakistani bowlers, he said pacer Shoaib Akhtar has a very long run. Indians are in a habit of wasting time on appeals. That often led to delays. The famous Sabri brothers — Mohd Sayeed Sabri, Mohd Fareed Sabri and Mohd Ameen Sabri from Jaipur who have carved a niche for themselves in qawwali singing are here to perform at the Sada-E-Sufi — 2004, a two-day programme of Indo-Pak Qawwalis at Mohali. It is being organised by the Sufi Foundation of India. The group is more known for singing in movies like “Heena”, “Pardes”, “Uff yeh Mohabbat”, “Indian babu”, “Yeh Dil Hai Ashiqana”, “Parwana” and “Sheen”. The qawwali “Kahin der na ho jaye” is still loved by listerns for its sheer intensity. Originally qawwali was sung at dargahs of sufi saints. A lot of experimentation is being done in qawwali these days but Sabri brothers prefers to follow the tradition. “The element of ruhaniyat is very much necessary in qawwali for the right presentation, as this brings a singer closer to God. Even the right words are very important to bring the intensity in the qawwali. Drawing a lot from the sayings of Sufi saints, qawwali highlights the universal element of love and ibadat (devotion). It contributes a lot in strengthening in a secular society”, they say. Another qawwali Janab Amjad Farid Sabri from Karachi, Pakistan, who was also present here, said he was keen to target the youngsters.” I want that they should listen and understand my music. For them I have given a modernised look to my singing. I have paid special attention to the music also along with the words”, he said. His qawwalis follow the latest musical trends. Surprisingly, he has sung, qawwali in English also. “I simply try to deliver what the audience wants”, he says. Qawwali has a classical base and in order to sing it perfectly the knowledge of raagas is essential. Disciple of Gulam Farid Maqbool Sabri, Amjad feels that good music is must in qawwalis, only then can these become popular. Meanwhile, Ms Geetika Kalha, IAS, General Secretary of the Sufi Foundation of India, revealed that the society had taken two acres in Jalandhar to promote Sufi writing and poetry. She said they were in constant touch with the Punjab Art Council in Pakistan and were planning to send delegates to that country. Remember the strikingly fresh music of Hindi movie ‘Chameli’. It was ‘Sajna ve Sajna’ and Bhage re man mera’ which brought out the vivaciousness of Kareena Kapoor. Composed by music director, Sandesh Shandilaya these numbers speak of his immense talent. Sandesh who has given music in many movies like’ “Road”, “Kabhi Khushi Kabhi Gam”, “Chameli”, “Uff Kaya Jadoo Mohabbat Hai” was in the city on Tuesday along with lyricist Irshad Kamil for the publicity for his forth coming movie “Socha Na Tha”. It is Dharmendra’s presentation which will be released in December. Composing music for the films has somewhat limited his creativity” I have to compose music according to the script. There are seven songs in ‘Socha Na Tha’. But I have tried to give different touch to each”, he said. His longing to be free and independent found a mooring when his musical video album “Piya Basnti Re” became a hit. Luckily for him his teacher, Ustad Sultan Khan had sung for him, the album. He took basic training of music from Ustad Sultan Khan who is a noted Sarangi player too. Talking about the script of the movie he revealed that the theme of the movie is “You cannot plan your life” and nobody can predict the next moment”. Initially the hero declares to his parents that he is madly in live with a girl but later realises that he was not in love at all. For a change there is no villain in the film. A Product of Panjab University, Chandigarh, from where he has done Ph.D. in Hindi, Irshad Kamil tried many vocations before plunging into the world of music. Again it were the strikingly beautiful lyrics of “Chameli” which brought a lot of fame for him. ‘Socha Na Tha’ is his second movie. He has penned many scripts for serials, including ‘Sanjivini’, ‘Kratavya’, ‘Choli’ etc. He has studied journalism and has also worked as a reporter in many Chandigarh dailies, including The Tribune. But he took the risk and went to Mumbai to start a new career. His creativity got nationwide recognition, there and his forthcoming movies are ‘Shabad’ and ‘ Hip Hip Hurray’.